It's short on new, revelatory information. I'd be a embarrassed to have turned up so little we didn't already know after 20 months worth of work and $20 million. Roger Clemens has apparently been a bawdy little monkey. ESPN.com is reporting that there are over 9 pages of material specifically relating to him and 82 references to him by name. 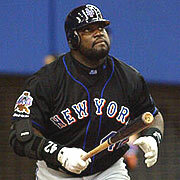 Human growth hormone appears to have performed as advertised for Mo Vaughn. As Rotoworld notes, HGH apparently does not help you throw to first base. The willful turning a blind eye in the face of overwhelming and obvious steroid use by players on the part of ownership and management is really reprehensible. Giant's GM Brian Sabean deserves particular dishonorable mention in this regard. See the section on Barry Bonds starting on page 121 of the report. Hey baseball teams, here's a suggestion -- when someone applies for a job with your organization as an athletic trainer or wishes to use your facilities while working with one of your players in the capacity of an athletic trainer, how about verifying that he is, in fact, a qualified athletic trainer and not a seedy gym rat who struggled to make the same middle school baseball team as your star player. With all the Mets of the early 90s on steroids, how come they sucked so bad? Players named in the report involved in trades or signing contracts in the last two weeks: Miguel Tejada (traded from Baltimore to Houston), Jose Guillen (signed with Kansas City), Andy Pettitte (signed with Yankees), Paul Lo Duca (signed with Washington), Eric Gagne (signed with Brewers). Nook Logan was also non-tendered by Washington on Wednesday. Thanks to Mike Stein for those last two points. 1) Having reviewed the report, I think it was improper for Mitchell to have included player names, given the nature and quantity of evidence included and the level of cooperation he received from the MLBPA and its members. To be clear, I don't think it's improper or unfair towards the players who were named: they made their beds and now they need to lie in them. Mostly, I think it's unfair to the public by virtue of the impression that it creates. 2) The report succeeding in doing a pretty clever job of what I'm sure MLB would like very much for it to do: laying the groundwork for moving past the issue. Less than half of the 88 players mentioned in the report are still in the majors, and all of the specific incidents described took place 2 or more years ago. It's easy for baseball to spin this in such a way as to suggest that the problem isn't really an ongoing one (or has at least been greatly diminished). But if you read between the lines, you get a sense of the culture of indifference (if not tacit support) that pervades baseball when it comes to performance-enhancing substances. There are so many stories of fellow players, clubhouse employees, training staff and management choosing to ignore evidence of the use of banned substances (the nonsense at the Giants being the most clear example). That just doesn't happen unless their use is simultaneously widespread, widely accepted and deeply entrenched. You're not going to convince me that in a few short years, that type of culture has been totally turned around, especially when the current drug of choice, HGH, can't be detected by available testing methods.